Startup Riocath is among Hello Tomorrow’s top 500 stratups in the world - i&i Prague, s.r.o. Hello Tomorrow, which recently partnered with i&i Prague to advance its mission fostering advancements in deep technology startups and businesses, will hold its global summit in Paris on 14-15 March. 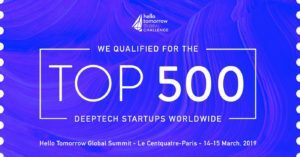 As part of the summit program, Hello Tomorrow highlights 500 of the most outstanding startups in the field of deep technology. This year’s top 500 selection includes another of i&i Prague’s very successful partners, Riocath, a company specializing in tubular medical devices. Included with this honor is the opportunity for Riocath to compete for one of the limited showcase positions at Hello Tomorrow Global Summit 2019.